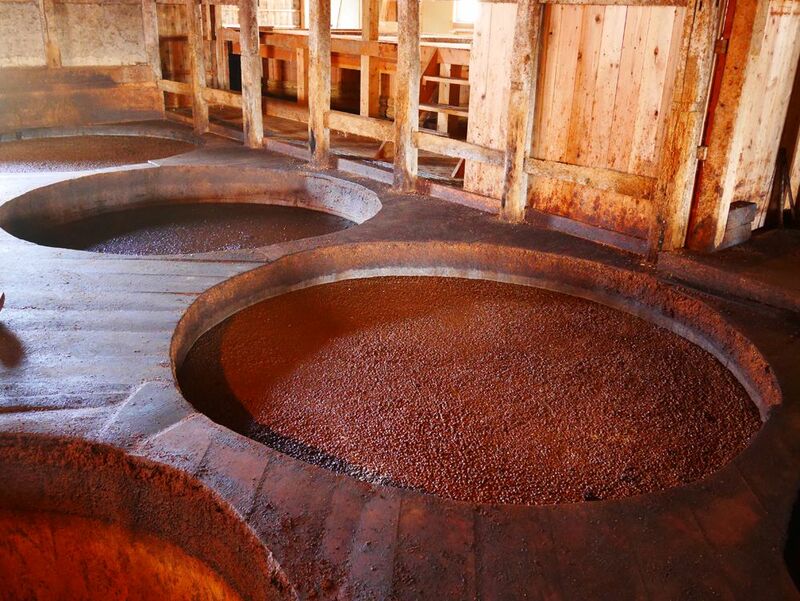 O ne of the best parts of adventuring in Japan, is exploring its world heritage cuisine. Japan has an exceptional range of unique and wonderful cuisine, and below are some images galleries and details to help get you get familiar with the types of meals and foods, diversity of ingredients, attention to food sourcing and preparation, as well as where and how it is consumed. Kyoto Kaiseki - Koetsu Mizusashi Bento — This is a traditional meal, famed in Kyoto, and whose basic course ingredients have barely changed over hundreds of years. 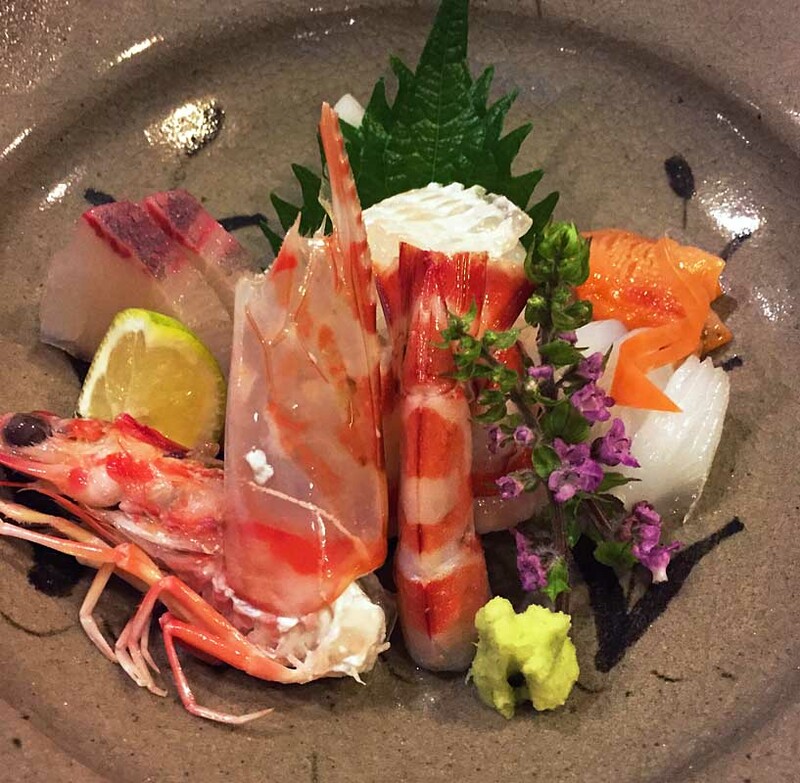 Sashimi with Ebi — Nicely arranges plate of fish with shrimp presentation as the centerpiece. 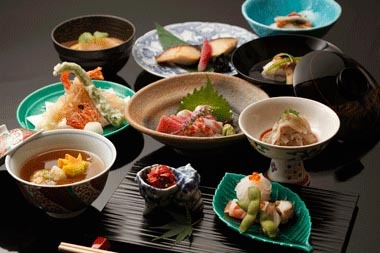 This is a typical course in a Kaiseki meal. 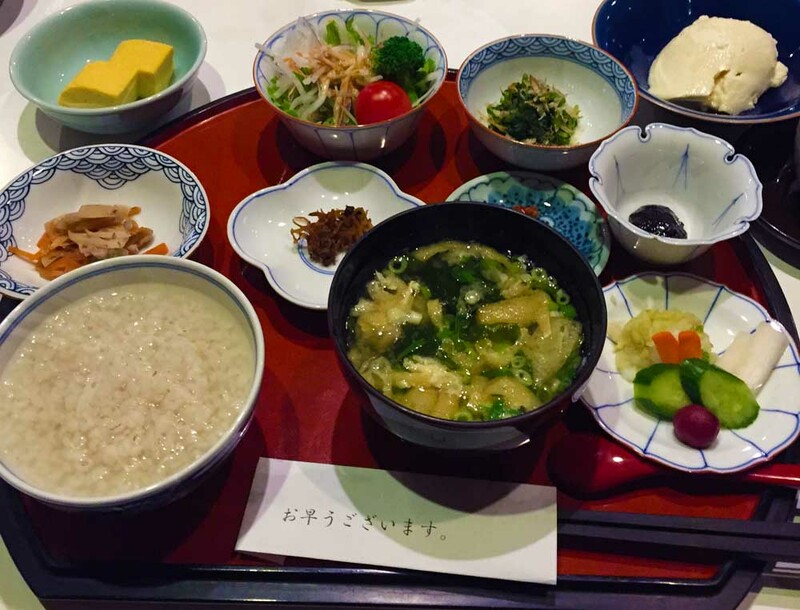 Traditional Ryokan Breakfast — Although not actual Kaiseki, the traditional Japanese Ryokan breakfast is served in Kaiseki style with numerous small dishes, but served in a more straightforward matter. 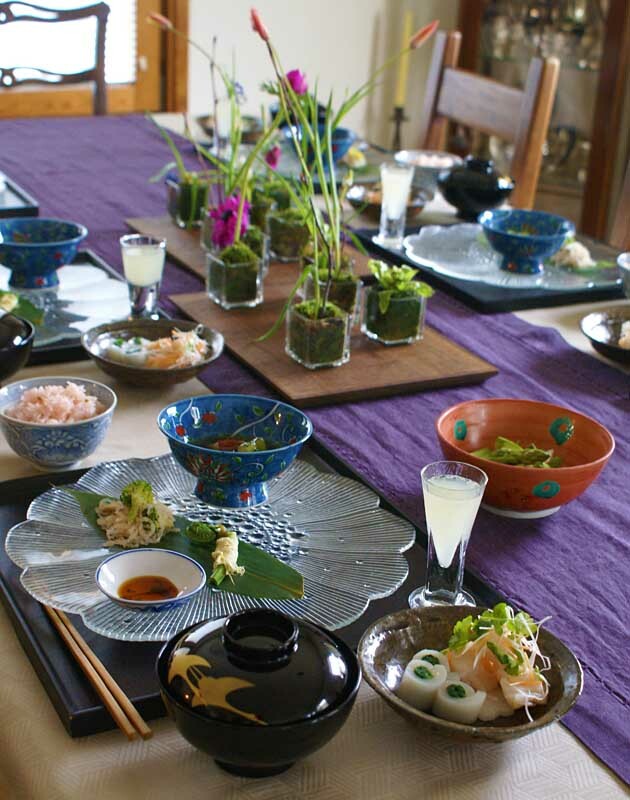 Kaiseki Style Arrangement — Classic Kaiseki style arrangement, although often the dishes are presented one at a time. 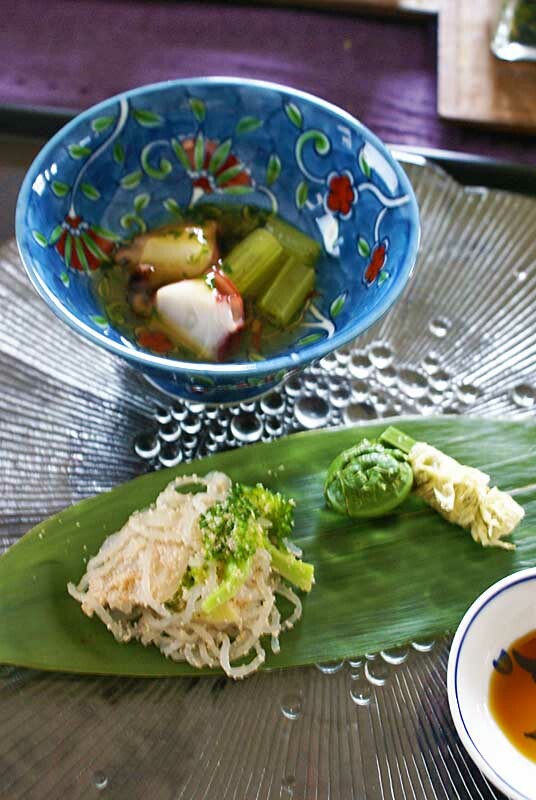 Kaiseki Vegetable Course — Gelatinous broth of Octopus with “fuki” (a mountain vegetable from the Japan Alps) and Shirataki (devil’s tongue) with coated with spiced cod row. 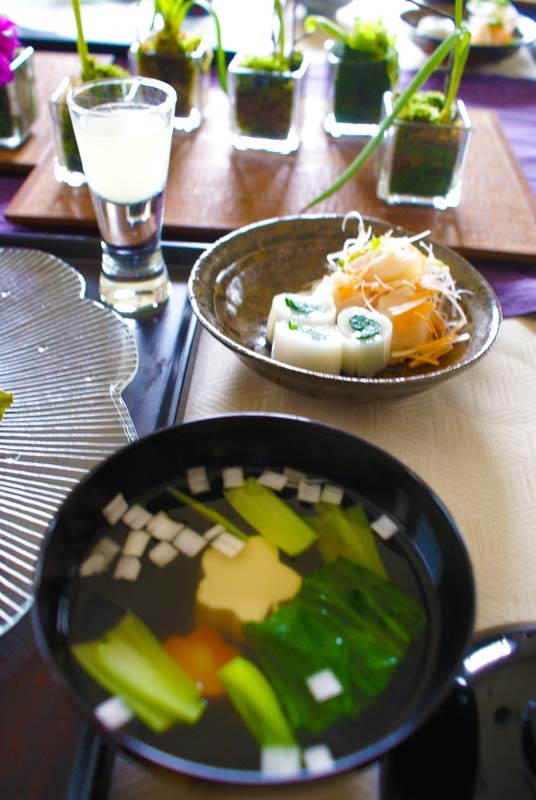 Kaiseki Style Soup and Arrangement — Osumashi, a clear fish based broth with seasonal vegatables. 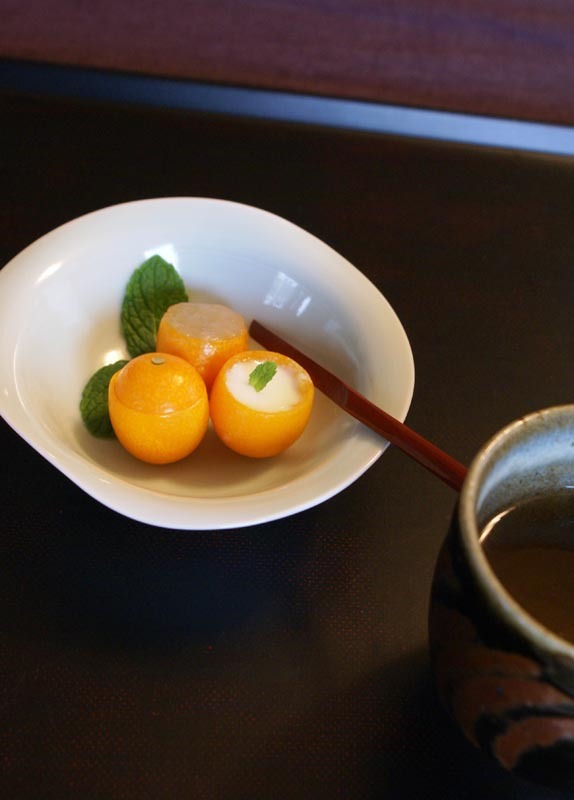 Kinkan Desert — Kinkan (also known as kumwats) are a small, citrusy seasonal treat, shown here filled with a light almond cream and served with Japanese brown tea as a typical desert course signaling the end of the Kaiseki meal. 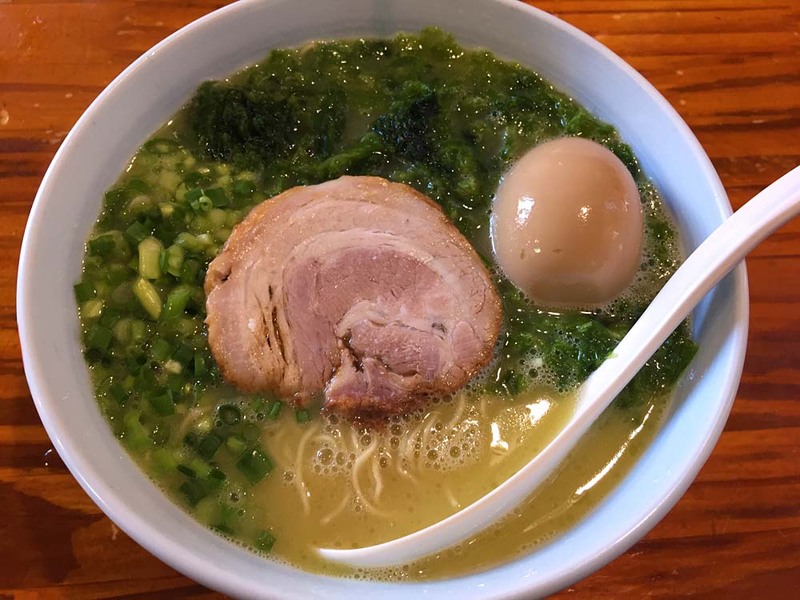 Traditional Hataka Ramen Noodles — Ramen, originally brought from China (la-men noodles) are thin noodles cooked in a miso, soy sauce or salt-based broth. 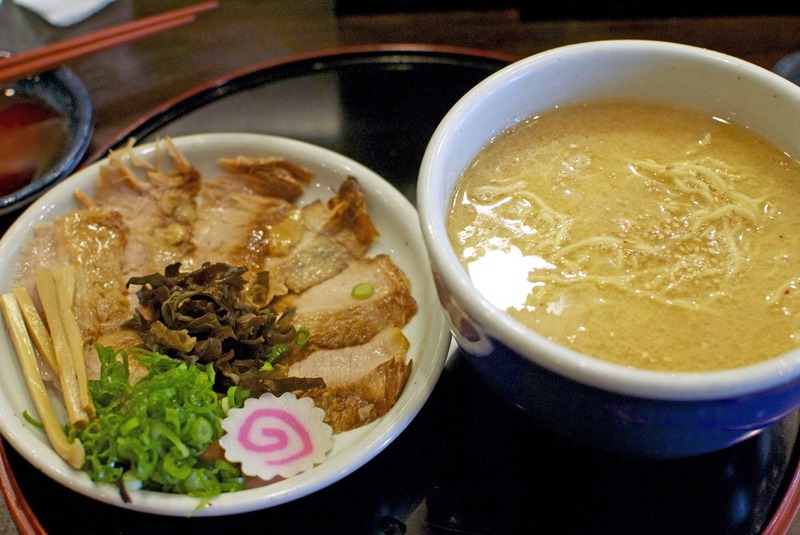 Hokkaido Style Ramen — Hokkaido Style ramen is distinguished by its miso based broth. In this version, you can add vegetables yourself – bamboo shoots, green onions, radish and mushroom. 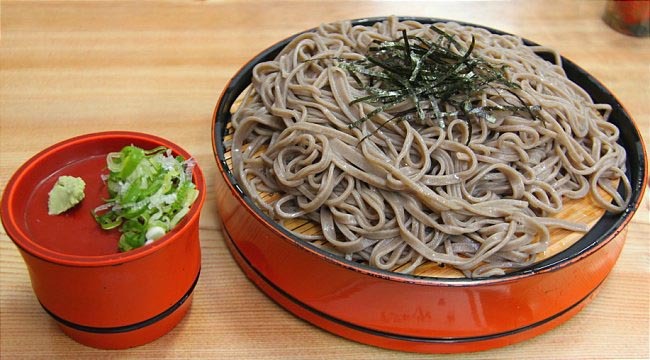 Soba (Buckwheat) Noodles — Soba noodles are milled from buckwheat and are harder and firmer than ramen and udon, which makes them particularly well-suited to dipping. Often served cold and dipped in sauce and sometimes accompanied by Tempura to make a satisfying lunch. 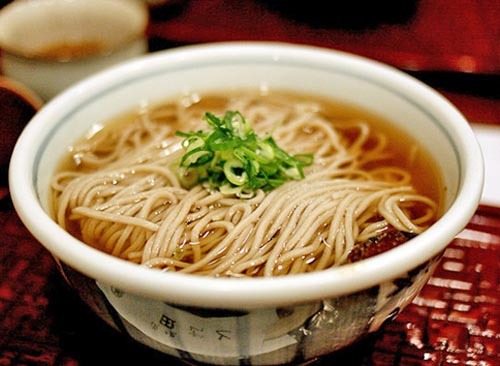 Hot Soba Noodles — Buckwheat noodles served in a hot soy-based broth is particularly welcome in the winter for lunch. 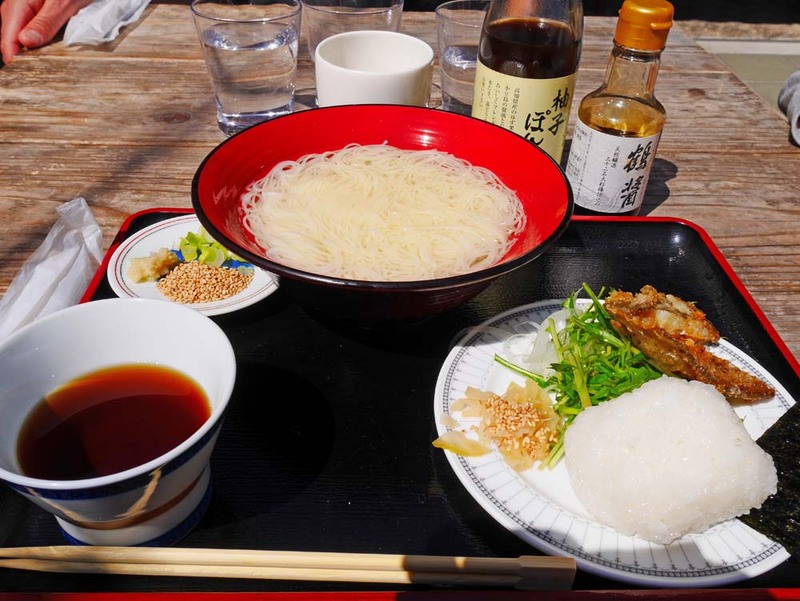 Somen Noodle Teshoku Lunch – Seto Islands — Thinner wheat based flour noodles are particularly popular cold in the summer months and are more prevalent around Shikoku and the Japan Inland Sea area. 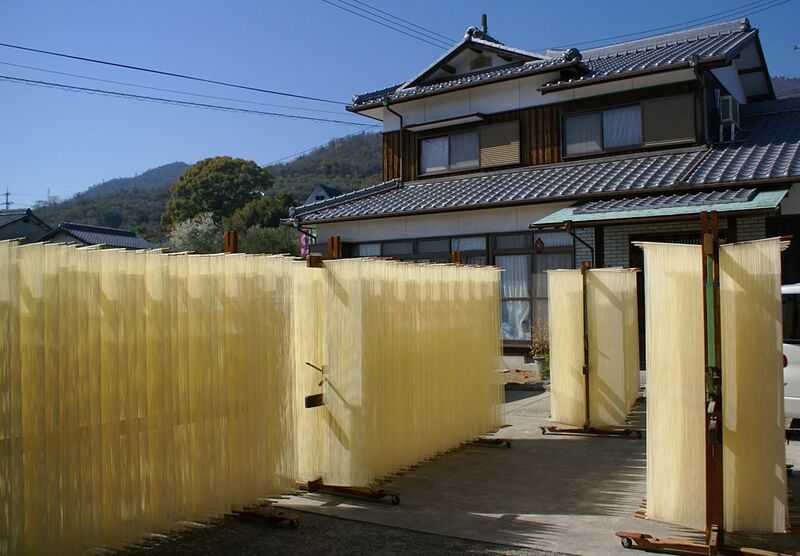 Somen Noodles Drying – Seto Islands — The thin wheat noodles are cured and dried at source, in this case the house next to the wheat field on the island of Shodoshima in the Japan Inland Sea. Sanuki Udon — Simple but superb Sanuki Udon. 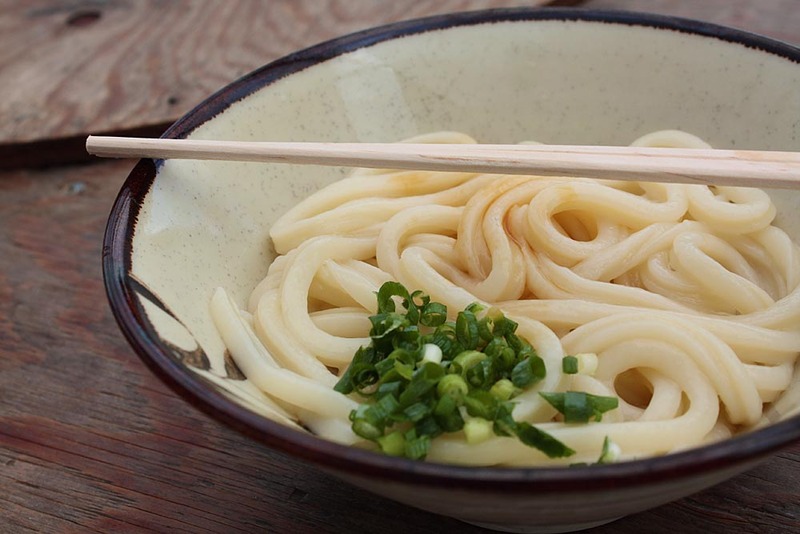 This typically thicker white wheat flour noodle can be enjoyed hot or cold and Sanuki Udon is by far its most famous. 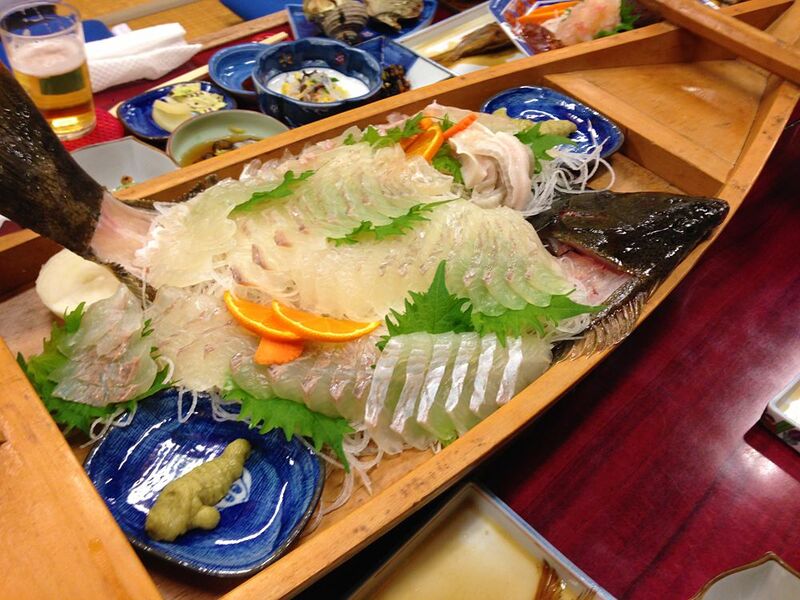 It is a staple of Takamatsu on the island of Shikoku on the Japan Inland Sea. 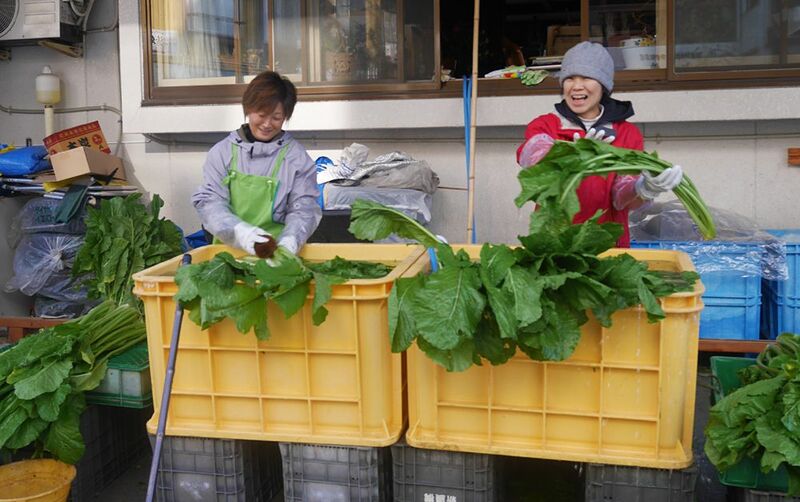 Nozawana Vegetable Harvest — Nozawana is a famouns mountain vegetable of Nagano and in particular Nozawa Onsen, where the public onsens are used in the fall to help wash and clean the crop in preparation for pickling to keep for the winter. 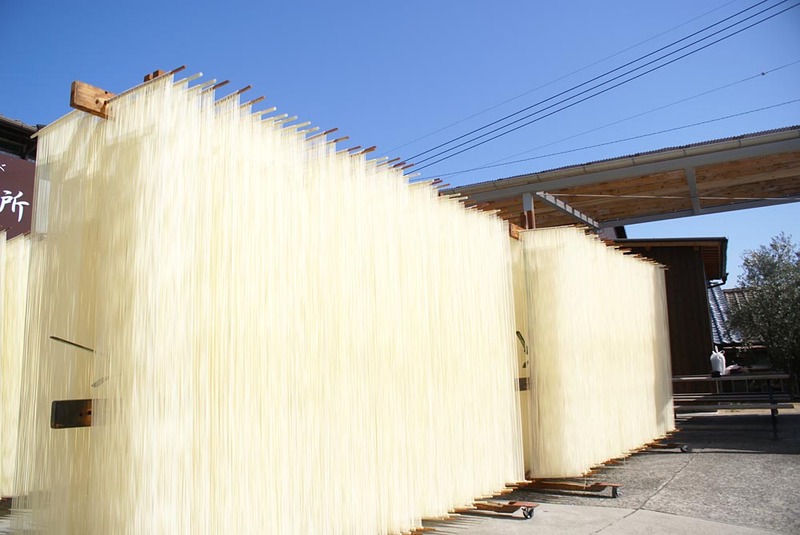 Making Somen Noodles – Seto Islands, Japan Inland Sea — The thin wheat noodles are cured and dried at source, in this case the house next to the wheat field on the island of Shodoshima in the Japan Inland Sea. 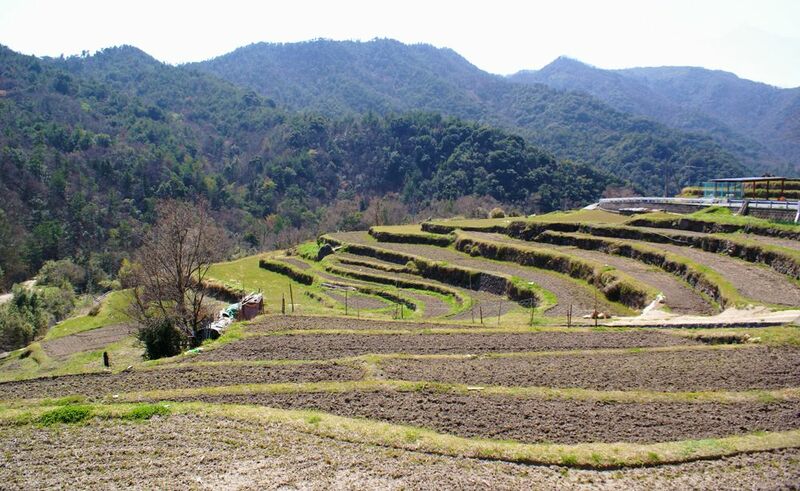 Terraced Rice Fields – Seto Islands — Terraced rice fields in Tokushima, which typical of much of Japan given that 80 percent of its terrain is mountainous. 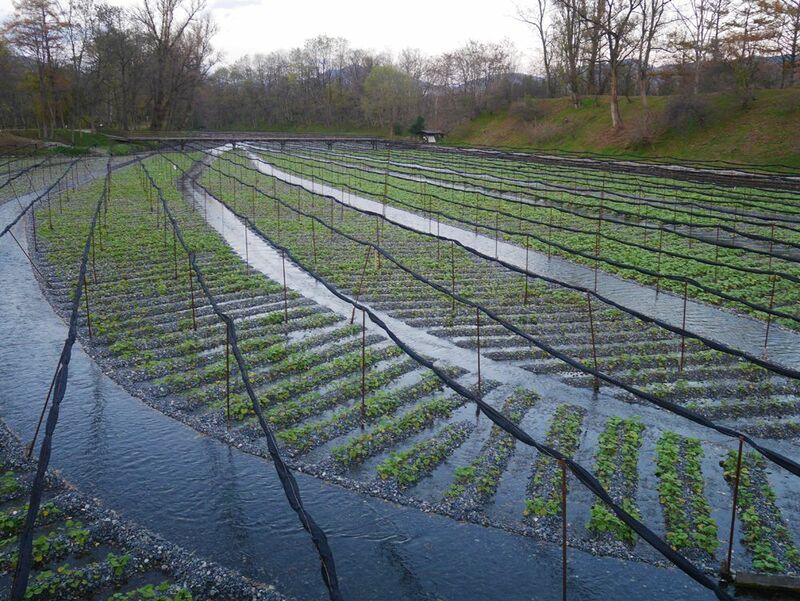 Wasabi Farm, Nagano — Wasabi farms dot the riverbeds of clear cold mountain water running off the Japan Alps. 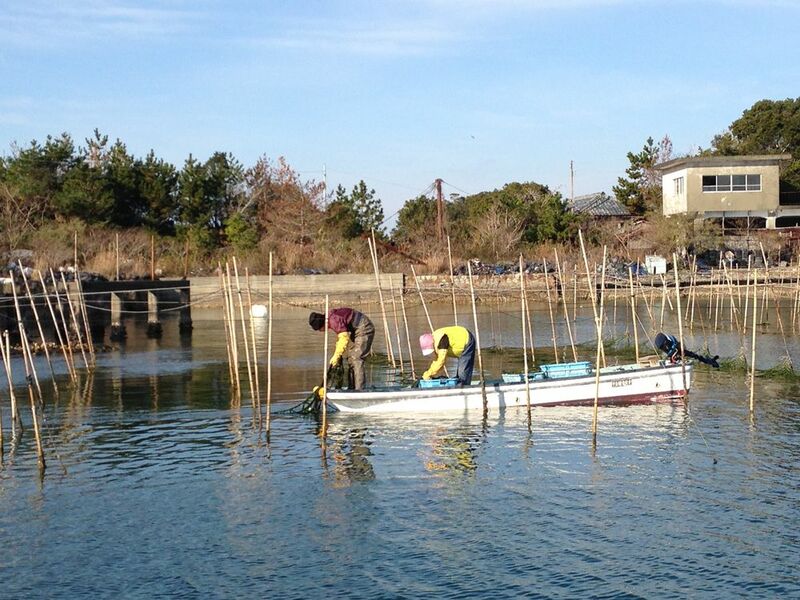 Oyster Farming – Ise Shima Islands — Locals farm and harvest Oysters and other Shellfish right next to their traditional Japanese Inn (Ryokan) in the Ise Shima Islands of Mie ken. 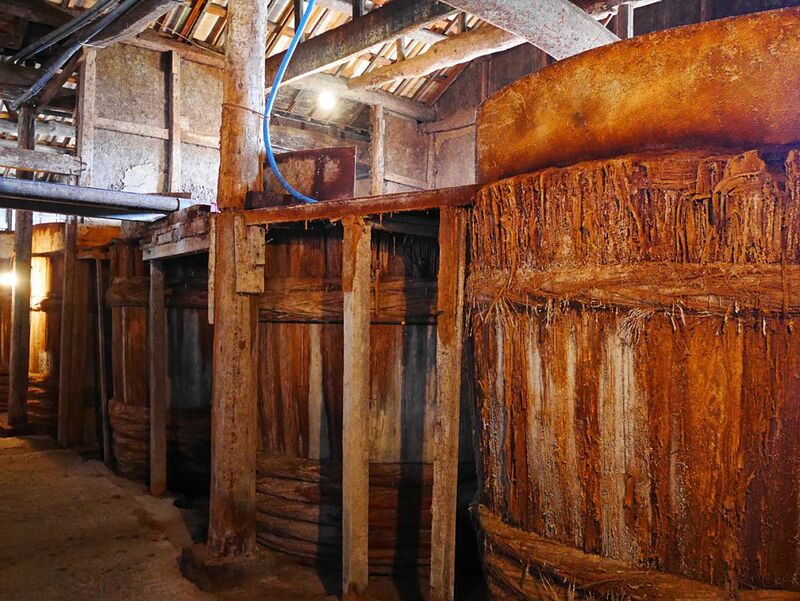 Soy Sauce Barrels – Seto Islands — Shodoshima island is one of the most respected areas for production of Soy Sauce in the time tested manner, requiring specially cured wooden vat and knowledge. Sashimi Plate, Kamakura Japan — A typical “moriawase” assorted sashimi plate, seen and served at restaurants all over Japan. 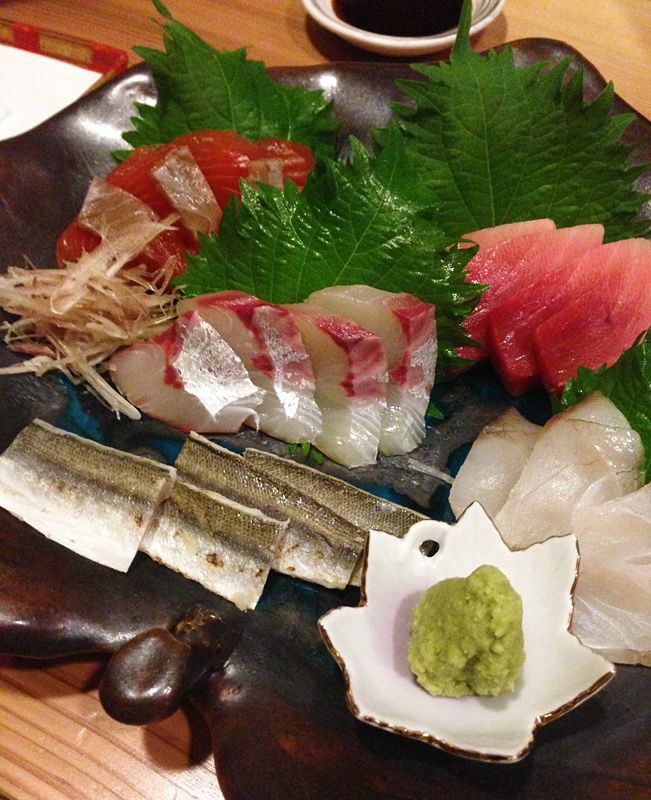 This one includes Iwashi (sardines), Hamachi (yellow-tail), and Chutoro (slightly fatty-tuna). Chutoro (Lightly fatty bluefin tuna) at Tsukiji — This cut shows the slightly whitening and marbeling of highly prized Maguro as you near the belly of this wonderful fish. Here it awaits preparation from the wholesale market to sushi restaurants. 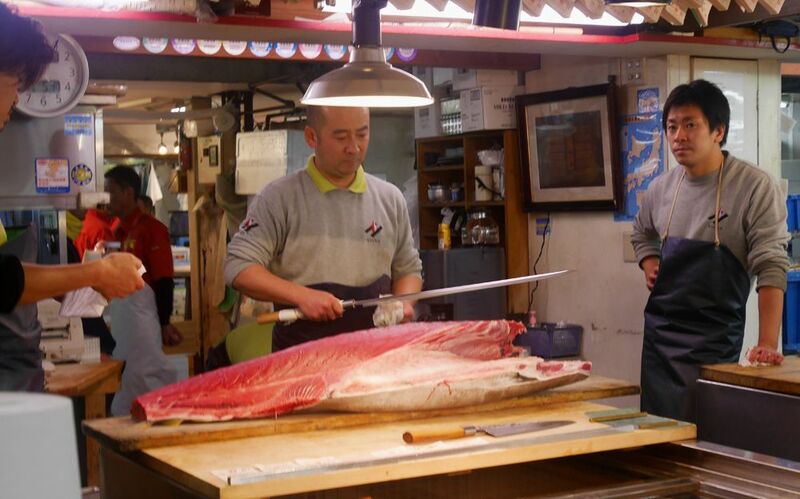 Maguro (Bluefin Tuna) at Tsukiji — A Bluefin Tuna at the Tsukiji Fish market being prepared for sushi restaurants. 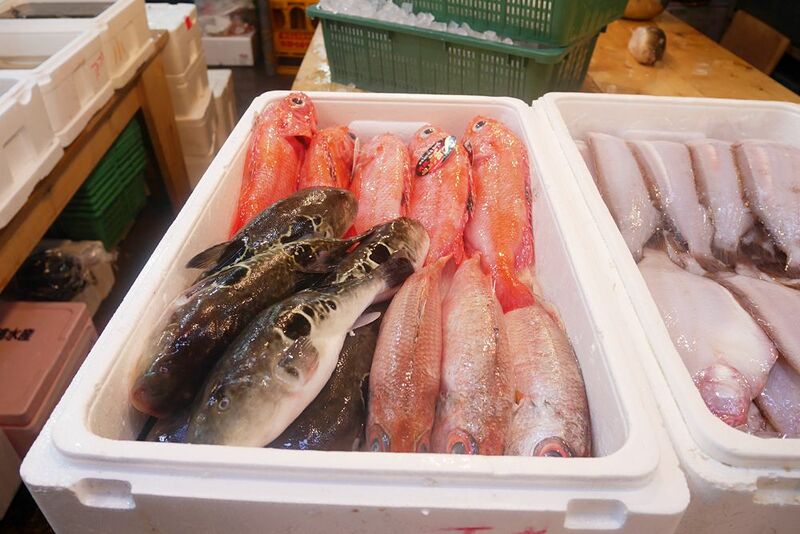 Fugu (Blowfish) and Kinki (red rockfish) at Tsukiji — Just a few of the colorful and delectable sea creatures on offer at the Tsukiji Fish Market. Sashimi Plate – Ise Shima Islands Ryokan — A lovely sashimi platter of local Kare (flounder) caught right next to the Ise Shima Island Ryokan and prepared just for its guests. 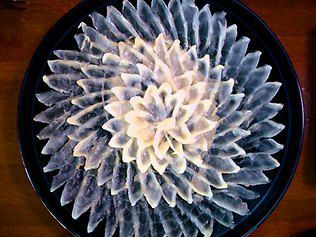 Fugu (Blowfish) Sashimi — Beautiful and transparent Fugu (blowfish) is a delicacy. 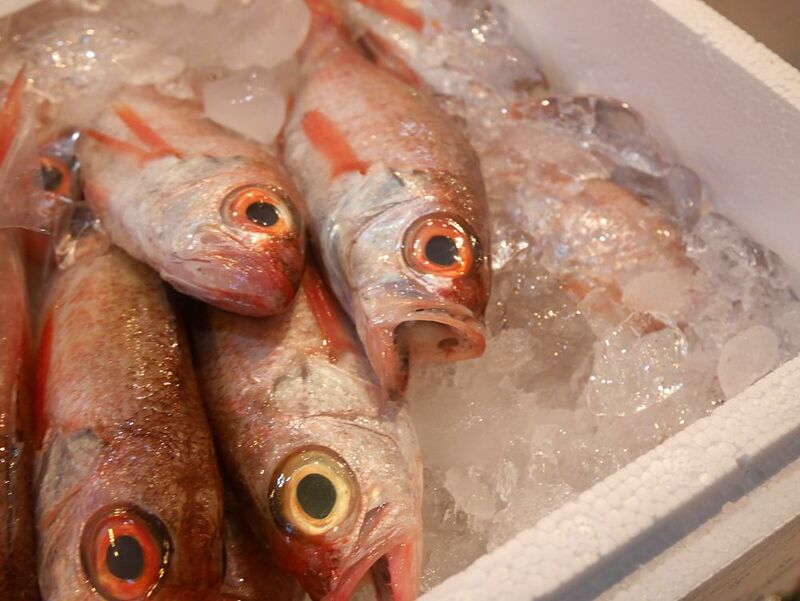 The chef must pass rigorous tests and be licensed before being allowed to prepare this fish. Its gallbladder is poisonous, but the rest of it is delicious. 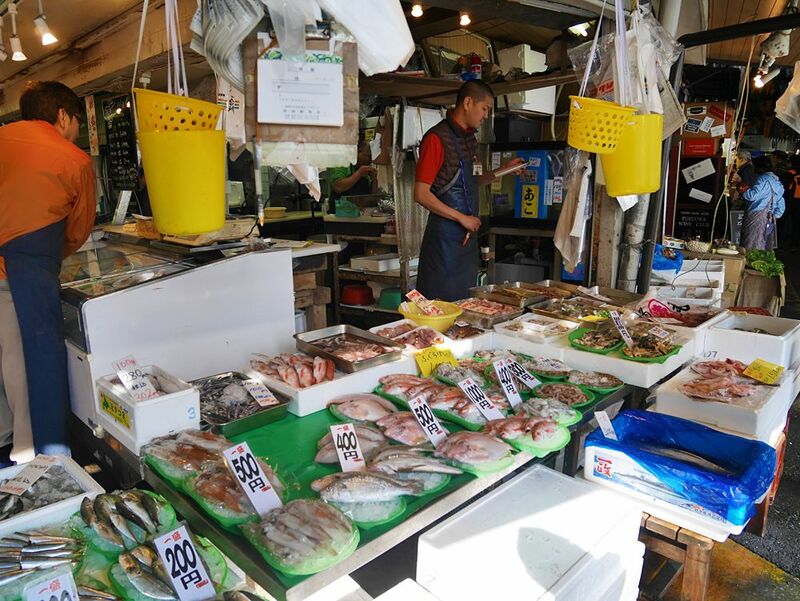 Local Fish Market, Kugenuma Japan — One of thousands such small local fish markets found throughout Japan. Iga-gyu Wagyu beef, sliced for Sukiyaki — This exceptional meat is from Iga-Ueno in the prefecture of Mie, just north of east of Kyoto and Nara. 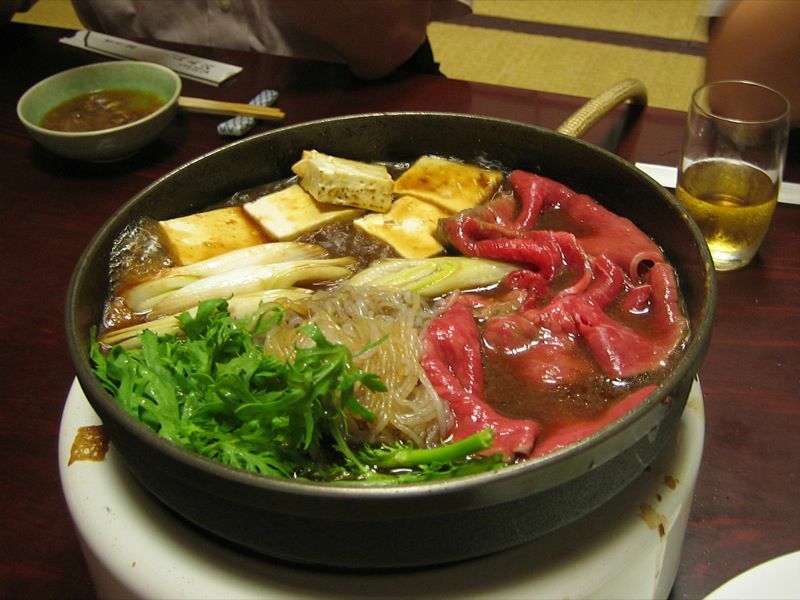 It is sliced here for Sukiyaki where it will be quickly cooked in a cast iron pot with vegetables and a slightly sweet soy-based sauce. Sukiyaki — Sukiyaki pot filled with seasonal vegetables like negi (scallions), mizuna (a leafy green) and shitake mushrooms along with tofu and clear rice noodles... all flavored by that wonderfully marbled wagyu and sauce of soy and brown sugar. Hida-gyu Sirloin Steak — A very nice cut of meat from Hida-Takayama in the Japanese alps. 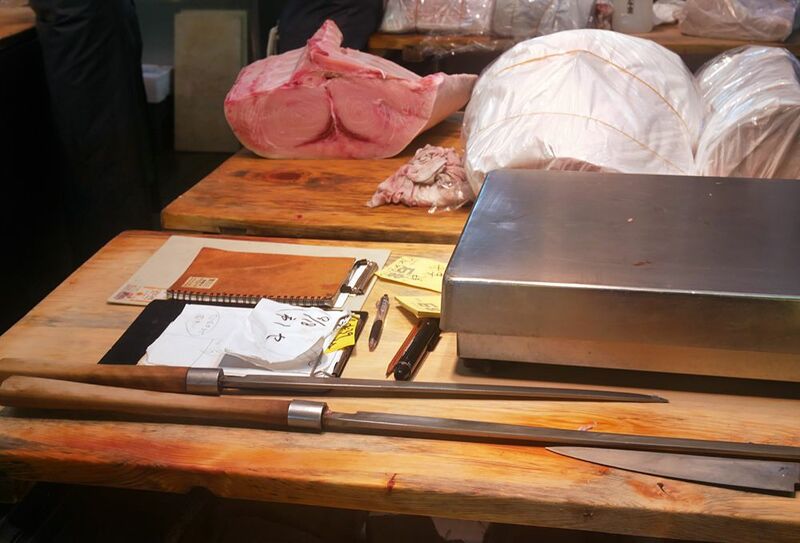 The meat is known for its exceptional marbling. 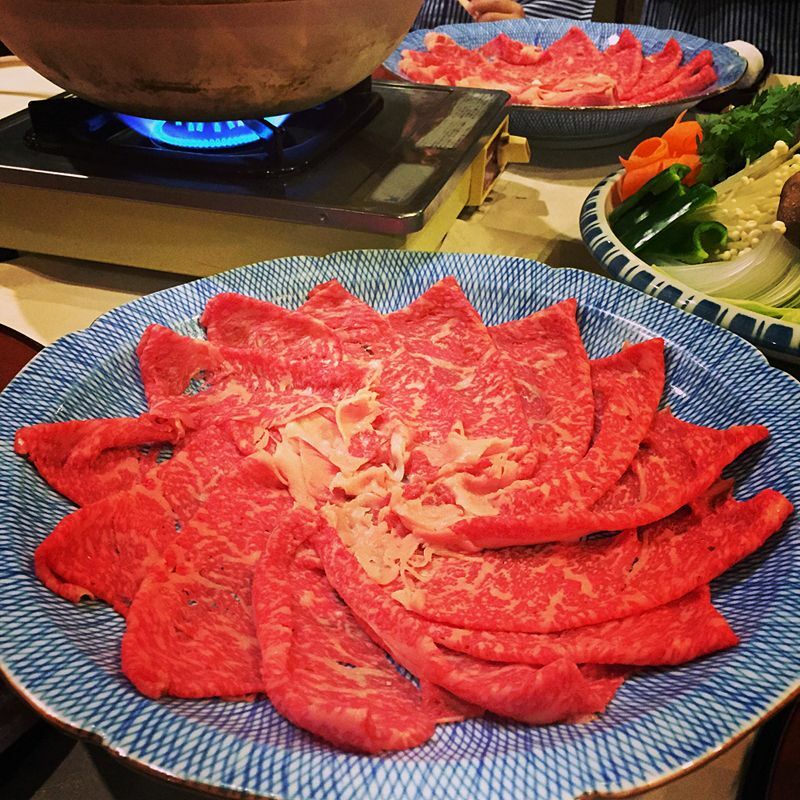 Ishigaki-gyu – Yakiniku Style — Originally from Korea, Yakiniku has been embraced by Japan and slightly adapted with less spice to let the full flavor of their wagyu come through. 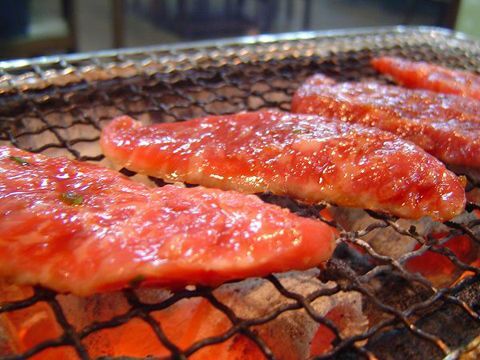 Grilled on the table in thin slices over an open flame, with maybe a little salt or a tiny drop of sauce, then straight into your watering mouth. Ishigaki Cattle — One year-old male on Ishigaki island in Okinawa prefecture. 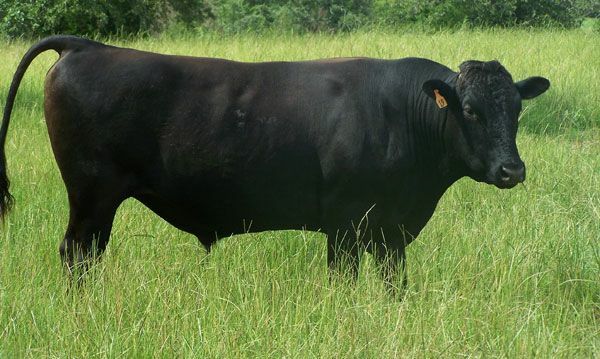 Naturally reared on special local grasses, wagyu (Japanese beef) from Ishigaki island is another famous producer of fantastic meat. 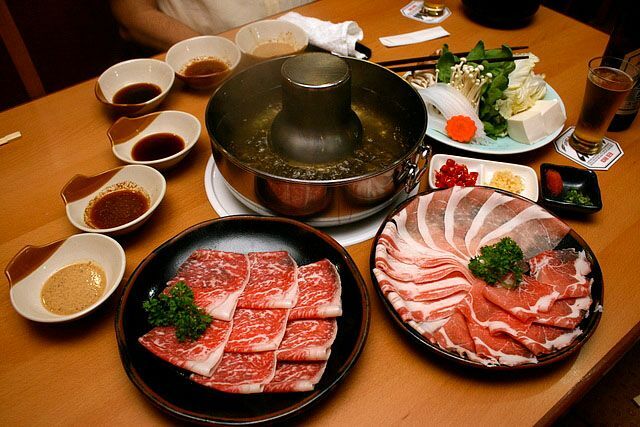 Shabu Shabu Set — Shabu shabu is a method of cooking where the beef is sliced transparently thin and then quickly dipped in a hot broth on your table and then dipped into one of several sauces. 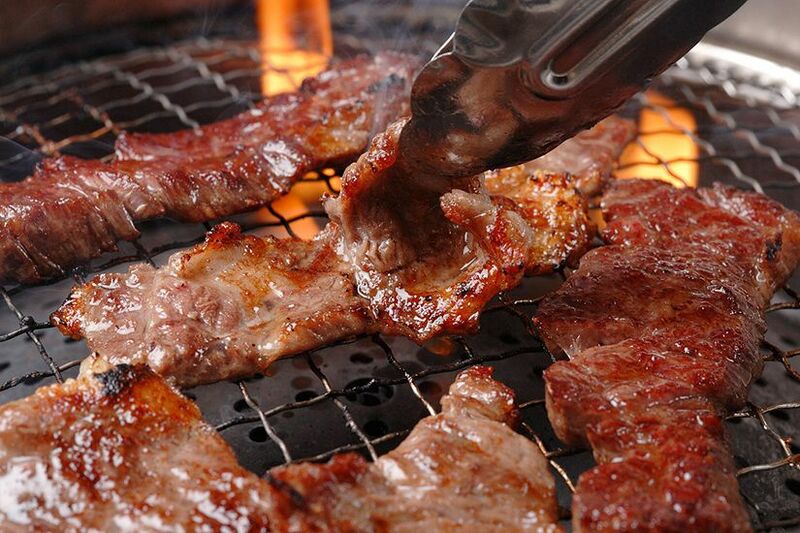 Wagyu Yakiniku — More Yakiniku – Japanese beef grilled over an open flame. 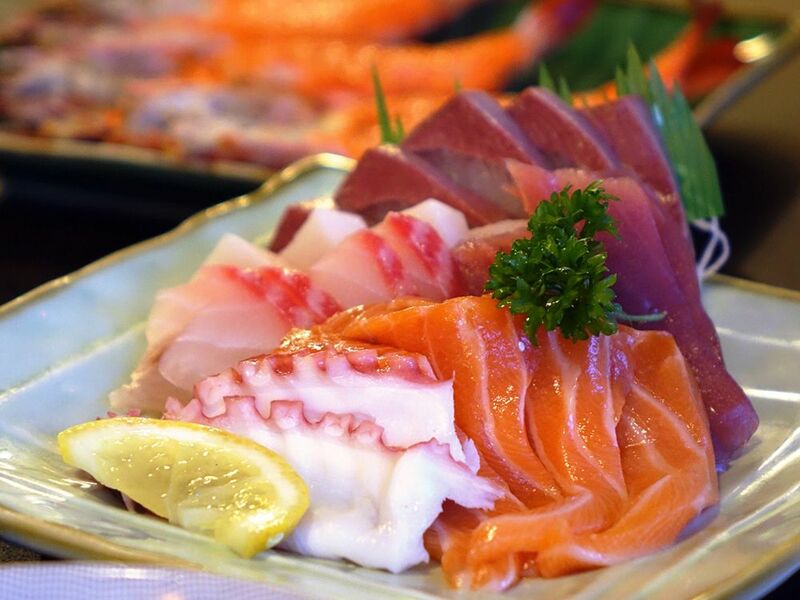 Japanese cuisine ranges from traditional, multi-course kaiseki meals to comforting ramen noodles, boasting an incredible diversity of ingredients from mountains to sea, and differing in all four seasons. 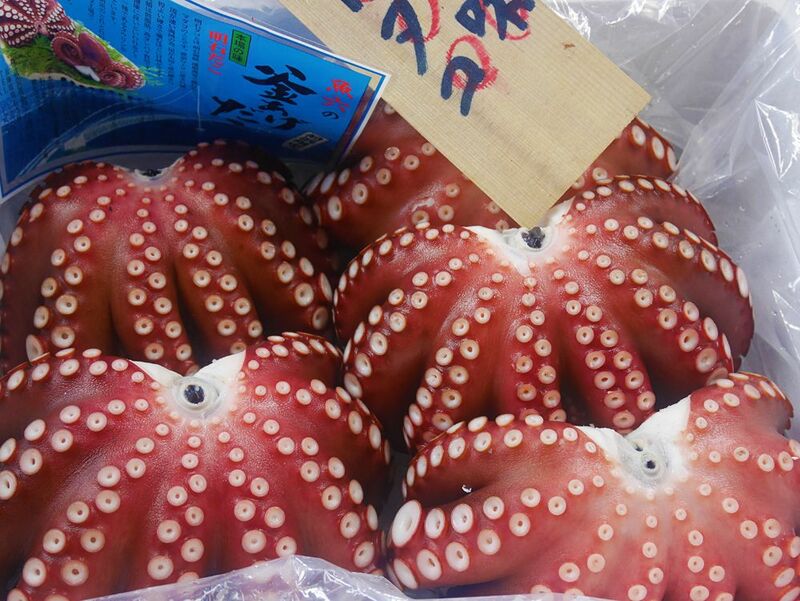 Japanese are unique in their attention to food sourcing, the detail in how they prepare it, as well as where and how it is consumed. The preparation starts at the source with a huge variety of incredibly small producers of everything from fish and creatures of the sea, to small plots of rice, vegetables, fruits and local regional specialties. Chefs search out and guard their sources carefully before getting on with their own, often painstaking and exceptionally labor intensive, preparation. 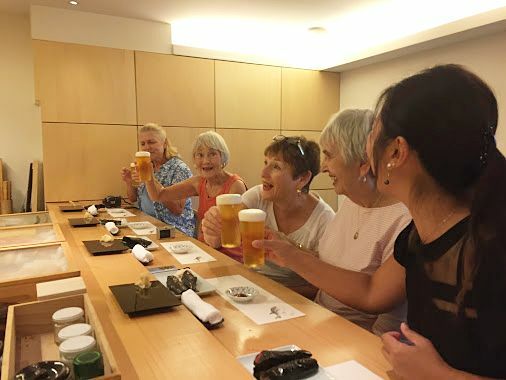 And then you get to experience these wonderful creations and concoctions in incredibly intimate eateries that are more akin to dining in someone’s home, in stand-up noodle stalls, sake bars and small, traditional working class izakayas, and of course in Michelin starred restaurants. Japanese are fiercely regional in their pursuit and execution of great food. 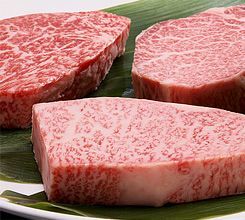 Ask someone where the best Japanese beef (“wagyu”) comes from and it won’t be from “Kobe” unless that person is actually from Kobe. More often than not you’ll get a half hour lecture on the qualities of and why that person’s hometown beef the best. The same is true for many other foods of Japan. So our trips highlight some of the best of Japanese cuisine both in terms of types of food and regions in this food obsessed nation. Gary really showed us parts of Tokyo that weren’t in our guide book and never would have gone to on our own. I can’t imagine going there with anyone else.